Over the past few years there's been a lot of talk about taking financial planning from an industry to a profession. But are the current initiatives on the right track? 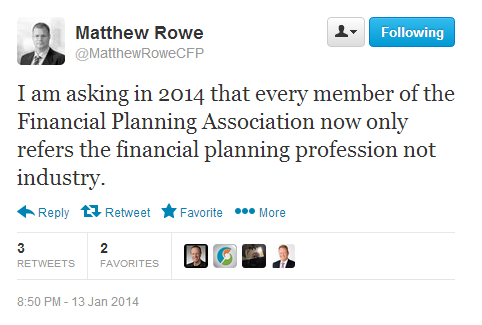 Earlier this month, Matthew Rowe, chair of the FPA, came out asking members to stop referring to financial planning as an "industry", and start referring to it as a "profession". This focus on the word "profession" seems a bit back-to-front to me. It's like trying to give yourself your own nickname. It's a label that is better bestowed on you by others, rather than self-proclaiming the title. The public needs to make the call, not financial planners. Over the last few years, in the quest to be recognised as a profession, the focus has been on moving towards the requirement to hold a degree; enshrining the term "financial planner"; and getting people signed up to a professional membership organisation. But achieving the "profession" title, should be the result of behaviour. Behaviour that is both consistent and seen. Not labels, pieces of paper, legislation and membership fees. The small suburban café near my home has one particular barista that is, what I consider to be, a professional. Maybe not the regulatory view, but the average person-in-the-street’s understanding and spirit of the word. I don't know or care whether he's won awards, attended a swanky coffee school or whether he’s a member of the Australasian Specialty Coffee Association. I care that he smiles widely when I enter; is helpful and attentive; makes awesome coffee; engages everyone at the table; and laughs at my family's cheesy jokes. He creates the best possible experience for each customer, and is focused on their needs. This guy is a professional, because he behaves professionally. Not because he's part of a "profession". What does this mean for financial planning? The behaviour that goes on behind office doors, and the behaviour the public sees. Not the old fashioned markers of a profession, like degrees and memberships. Missing a giant step on the path to becoming a profession. It's about not fighting against legislation which, in the eyes of the public, would have been a positive move towards changing views about financial planners; but about saying "if that's what the public needs, let's do it". It’s about not bemoaning the fact advisers are often towards the top of "least trusted" polls and relying on legislation to change public perception; but about taking initiative and collectively and proactively changing that perception ourselves. It's about not relying on professional memberships or university degrees to show evidence of competence; but about exceeding expectations every single day. It’s about putting clients first every time, regardless of what the regulators, politicians or media say. It’s about taking initiative to continually improve knowledge and skills to become better, more effective, financial planners. Eventually, the public will see it. What I'm not saying, is that financial planners do not behave professionally. But I think, how they’re seeking to gain recognition as a "profession" is misplaced. The actions don't seem to be consistent with the goal. Simply telling people to refer to them as a profession and relying on old fashioned "evidence" like degrees, legislation and membership organisations, seems backward. Advisers need to be showing people, every day, through the way they behave — towards clients, towards the media, towards the regulators, and towards others in the industry — that they are professional. Consistent, obvious, professional behaviour, as determined by the public. 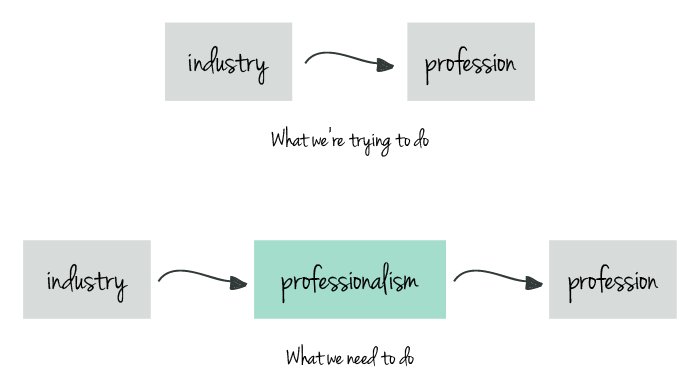 Only then, will the title of "profession" actually mean (and be worth) anything.